If something happens once, it’s a fluke. Twice, it’s a coincidence, but three times is a trend. And getting a cockroach stuck in your head is always unpleasant. Always always always. Doctors in Chengdu, China, had to remove a roach from the ear of a 60-year-old man Friday. The bug crawled miles into his ear on Feb. 1 and made itself very much at home, despite the man’s best efforts at removing it by sticking toothpicks and tweezers in his ear canal, according to The South China Morning Post. After three days, the frustrated man managed to kill the roach by spraying pesticide into his ear. But the bug was still stuck inside his head. 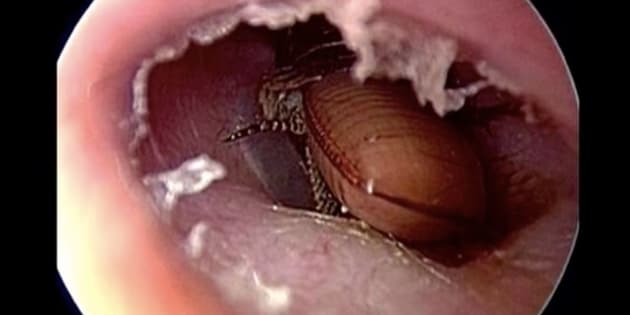 As the cringeworthy video above demonstrates, doctors had better luck than the patient and managed to pull out the roach in less than a minute. If one cockroach in the ear is bad, this news is worse: Turns out cockroaches in the cranium are more common than anyone wants to think. Last week, the world cringed at the story of a 42-year-old Indian woman, Selvi, who woke up in the middle of the night with the sinking feeling a cockroach had crawled up her nose. Doctors in Chennai, India, were able to remove it using a nasal endoscope despite it being stuck inside her skull between her eyes. The woman was lucky. Doctors said she could have died of infection from the unwanted head guest. We’re crossing our fingers that a third cockroach in the head story doesn’t pop up, but, like the word “fetch” from “Mean Girls,” some people are really trying to make cockroaches a thing this week. For $10, the Bronx Zoo in New York will let you name a Madagascar hissing cockroach after someone, er, special for Valentine’s Day. Recipients get an emailed certificate announcing they’ve had a bug named for them, according to The Associated Press.